Arabs in Gaza are swarming social media platforms and sending private messages to pro-Palestinian activists looking for donations. Is it just one massive scam? Or are Hamas utilising social media platforms, not just to spread propaganda, but as a pipeline to raise funds for their terrorist activities? Hamas are one of the most brutal terrorist organisations on earth. Some of their attacks, such as the Passover massacre in 2002 or the Dizengoff Centre attack in 1996, highlight an undiluted strategy of barbarism. All terror attacks are difficult to digest, but deliberately targeting elderly people at a religious service, or children partying in fancy dress at Purim, leaves a particularly bitter taste. In more recent years, Hamas have held Gaza’s entire population hostage. They seek conflict through firing indiscriminate rockets at Israeli population centres, thus deliberately placing their own civilians in harm’s way. Hamas then use the inevitable result as propaganda material for their cause. A calculated, callous and inhumane act. Because of Europe’s blind inability to connect the dots (a blindness that is tragically coming home to haunt them), Hamas has always worked hard on public perception. The Hamas propaganda machinery learnt to utilise social media platforms to perfection. The vast majority of distorted, manipulated imagery that is used by the anti-Israel squad in the west, emerges from the hands of Hamas in Gaza. With its military arm recognised as a terrorist organisation in most civilised nations, the more responsible charities have a difficult time trying to ensure funds do not become diverted towards terrorist activity. The Syrian civil conflict complicated matters further for Hamas, as it found itself alienated from its main sponsor, Iran. Hamas are currently handing out land to civil servants because they are unable to pay the wage bill. Hamas is a terror group desperately seeking both friends and funding. I have been active on Facebook for years, and apart from the odd scam, I don’t think I have ever been privately approached for money. Yet in discussion with some anti-Israel activists, I found that ‘being approached for money’ was almost a daily occurrence for them. I asked to see the evidence (in some cases I have removed the name and/or the timestamp to protect identities). This private conversation began with a short introduction. Within minutes the first picture of a destitute child appeared. However, despite the original comments being in English, the 3rd post was sent in Spanish. Clearly part of the ‘pitch’ taken from the wrong ‘script sheet’. The next post simply asked for money. When asked how to donate, a detailed explanation of the Western Union process appeared, with an instruction to state the money was being sent to ‘a friend’. The name given for the Western Union transfer and the name on the Facebook profile were not the same. A quick search under the real name given, highlighted a link to an old ‘Gofundme’ page titled ‘Support freedom for Palestine’. Whoever this person is, they have 98 mutual friends with a British activist. The person made no communication other than the request for money. It is possible this is just a poor man trying his luck on a gullible target, although the scripted Spanish, the fine attention to detail over the Western Union process, suggests something more organised. Which again suggests an industrial sized scam taking place. As always, Hamas propaganda is never more than a stone’s throw from these people. This is an article written by Hazem at the height of the 2014 Israel / Hamas conflict. Ordinary Gazans these people are not. The next post I was shown was sent by ‘Anas Mansour’ and simply contained a link to a Palestinian charity called ‘Hope Bridge Charitable Association‘. 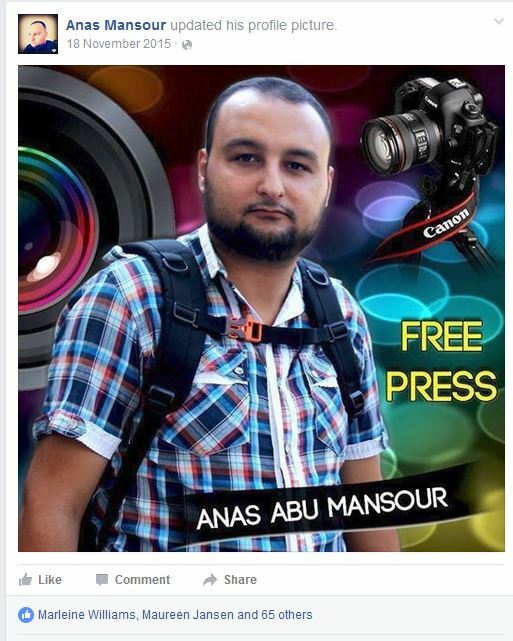 Anas, the person who sent the message, is an oxymoron, or what is called ‘free press’ in Gaza. Again we are dealing with someone who spends much of his time posting propaganda. Less than a year ago, Anas stopped posting almost exclusively in Arabic and began posting almost exclusively in English. It is a trend I first discovered in my earlier research on scholarships amongst potential students. A complete change in target audience. A sudden burst of propaganda posts. The next message stream I was shown was from an ‘Aya Mohammed’. Aya declares on her Facebook page that she studied at Al Aqsa university and is an ‘activist for Palestine’. Aya also has a Facebook page full of propaganda directed at foreign activists. 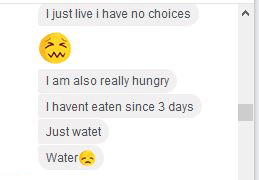 Aya described desperate poverty and asked if it was possible to send money, with links to a fundraising page on ‘youcaring.com’ (page since removed). 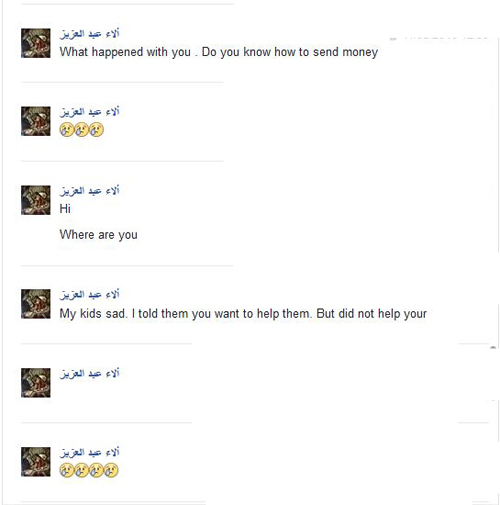 Abu has three children, he asked for money via Western Union. Like the others he gave a completely different name for the money transfer. Abu also operates more than one Facebook account. On the second account he only has two children. Like most of the others, Abu claims to be educated to university level. The next message was from Nabil Abed. Nabil only started using *his* Facebook account 4 months ago. His Twitter account started at the same time. He immediately began posting propaganda in English. Within days he was networking with foreign activists and sending private requests seeking funding for his education. Nabil already has over 250 mutual friends with the account I viewed. Abu is using the crowdfunding site Indiegogo, and utilising Facebook to network with foreign activists and ‘PM’ them seeking assistance. “I graduated from college three years ago, Business Administration, Because of the blockade I am unemployed. 3 years ago. I married and have Two children. I can not meet their needs. I live in fathers house. we have 9 persons in household include my nephew and niece. His campaign target if $5,700. The average wage in Gaza is about $174 a month. You do the math. The next message came from someone whose name is written in Arabic. When eventually she wanted a transfer through Western Union, she gave the name as ‘Alaa abed alaziz almasri’. This is another new account. This time from January 2016. 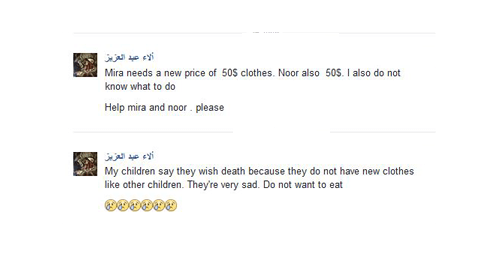 Alaa posted private pictures of her children, saying she needed money for food. Alaa was persistent, sending frequent messages and using her children as ‘guilt tools’ to extract assistance. Deprived children were a persistent theme. Many pictures of children, normally under the ages of ten and always images that were designed to pull at heart strings. I tried to experiment and contacted a few accounts who had made contact to check response times. I sent messages to eight different accounts. They all responded within five minutes. ‘Anas Anas‘ needs lots of funding to build an education centre. In the profile he says he is a student and he confirms this in private messages. The account is full of propaganda and Anas Posts in English. Yet Anas has a second account, one he uses in Arabic. 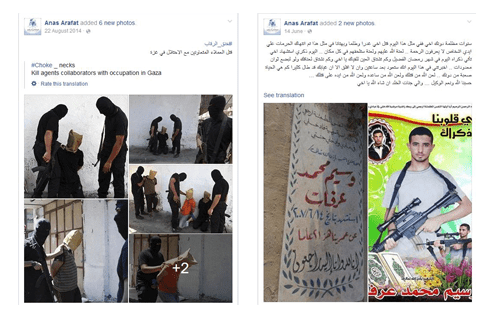 The image on the left was from the events in August 2014, when Hamas conducted torture and ‘harrowing extrajudicial killings‘ by settling scores, using claims of collaboration and conducting executions in public. Here, with a post at the time, Anas is clearly conducting a Hamas propaganda exercise. The image on the right is what appears to be a deceased family member. Anas posts the image frequently, both on the ‘martyr’s’ birthday and on religious memorial days. Despite his claims, he is clearly not what we would describe as a humanitarian. Between Facebook and the foreign activists, also sit the crowdfunding sites like Indiegogo or gofundme. One of the largest projects is the reconstruction of a disabled school. Over $70,000 was raised by April of 2015. One of the two people named as being behind this project is Dr. Basel Abuwarda. In the real world, the chances of my research stumbling across a humanitarian activist 1000’s of miles away would be incredibly small. But this is not the real world. Dr. Basel Abuwarda has form. BBC Watch picked up on Aburwarda twice, once during the conflict in 2014 and the second time pushing the Gaza flooding myth early in 2015. Part of the Hamas PR mechanism. There are several crowdfunding sites. Many causes are set up by people in Gaza. *No doubt some are legitimate*, but how many are not? How many are using a different name, running several campaigns and changing the spelling of their name each time they open an account on Facebook? 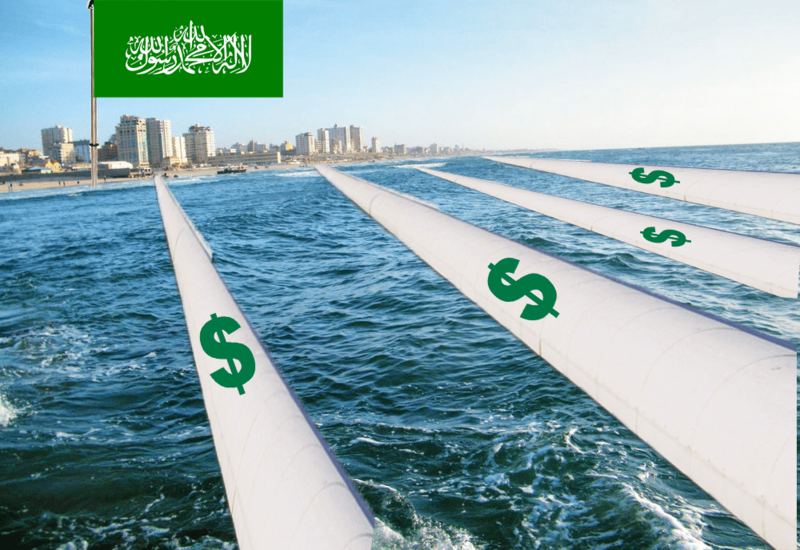 A scam or Hamas driven? There are three types of people in Gaza. Those who assist Hamas, those who say nothing and those who Hamas execute in the streets. The scores of messages I saw had several things in common. The people almost all claimed to be university educated. They seem to be continually online. They have a fast internet connection, webcams and smartphones. They have on average over 150 shared contacts with the account I viewed. Whatever these people are, they are not the destitute people of Gaza. I wanted to see if there was a follow up. After achieving the funds, did the people do what they claimed they would do with the money. How many of those who received funding for studies abroad, are still posting propaganda in Gaza? Worryingly, there does not seem to be a mechanism for checking this. Do not forget. Almost every single person checked who is raising money in 2016, was actively spreading propaganda during the conflict in 2014. Here is the indiegogo page for Hani Salamah. Here is a post of his from the conflict in 2014. ‘Yousef Al Tah’ has an indiegogo page. Both the ‘confirmed’ links to his Facebook account and to his Twitter feed, ‘errantly’ lead to a separate website simply called ‘Donate to Gaza‘. The PayPal donation button is sending to an email address ‘danyqran14@gmail.com’. Just whose email address is that? ‘Fadi Rouk’, has a ‘youcaring’ donation page, but Fadi is another activist who suddenly started posting in English rather than Arabic in late 2014. There are also donation pages started in Europe or America on behalf of someone in Gaza. How does anyone know if the back story is accurate. Does anyone actually follow up on the process, or is a manipulated picture of completion, courtesy of ‘Pallywood’, enough to satisfy all the donors to the cause? ‘Sara Faud Arafat’ runs the ‘Nebras Initiative‘ on YouCaring. Sara has over 2000 friends on Facebook. Yet does not seem to have a single friend who is not an activist of some description. No family, cousins, friends. Sara started the Facebook account about 12 months ago. I could not find a single reference to her outside of the circle of Facebook and the YouCaring page. ‘Ali Mohammed’ has an Indiegogo page. It is a page without external verification (no social media links). The person pushing that page on Facebook is Mohammed Mahmoud. Mohammed only started posting less than a year ago, his first posts were asking for donations and almost all of his contacts are foreign activists. So nobody underestimates the success of the process. This is just one of his posts. At the very least, many of these people are involved in an elaborate scam, but indications are it is more serious than that. These are the very people spreading the propaganda about genocide. They are part of the disinformation industry. They are convincing humanitarians abroad that Gazans are victims of a genocide and without food to eat. This even as they sit there with their online access, their webcams and their smartphones. They then ask for money. As a target audience, foreign activists are perfect. They are concentrated in a small space. Many are obsessive and almost none check the veracity of the message they are being given. The term ‘like shooting ducks in a barrel’ comes to mind. Additionally, because Facebook is ‘merely’ a social media platform, anyone can open an account in any name they choose. Beyond an email account which can be set up freely in minutes, you need no documentation whatsoever. Double and triple accounts, deliberate misspelling of names, completely false identities. There are also tell-tale signs in what I did not see. I did not see a single message sent from anyone in the West Bank. None sent by anyone seeking assistance for the Syrian refugees. 100% of the private requests came from Gaza. As Ami Horovitz found in Portland State University, people are willing to donate directly to Hamas. I cannot be sure of the scale of what is occurring, but I saw dozens in a single Facebook account. Each of them were connected to dozens if not hundreds of other activists. Each activist would have others connected to him. This in every community where BDS operates. Crossing nations, crossing continents. This is a massive industry, and we are potentially talking about millions of dollars. As the foreign activists are truly duped by the propaganda, how many of them are giving their money online, directly to someone in Gaza? Someone who could well be sitting in a room with other Hamas operatives, all doing the same thing. And remember too, that for every visible project, for each of the crowdfunding pages, there are scores, hundreds, if not thousands of requests, taking place behind closed doors. An entire industry that lives in the shadows. Originally posted by David Collier at BEYOND THE GREAT DIVIDE. Previous From the desk of Dr. Ron Weiser AM. July 2016. Opinion piece.